Gordon Brown's Better Together speech, Glasgow, 17th September 2014. 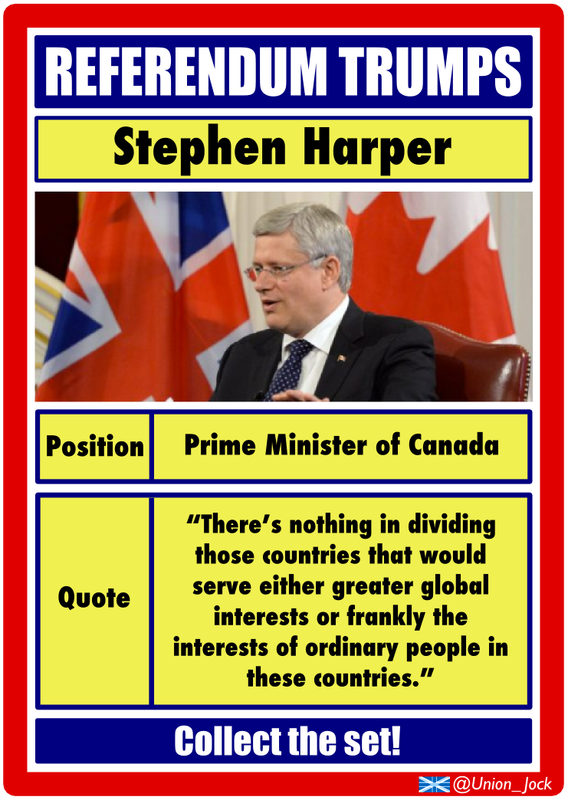 Referendum Trumps No.12: Capt. 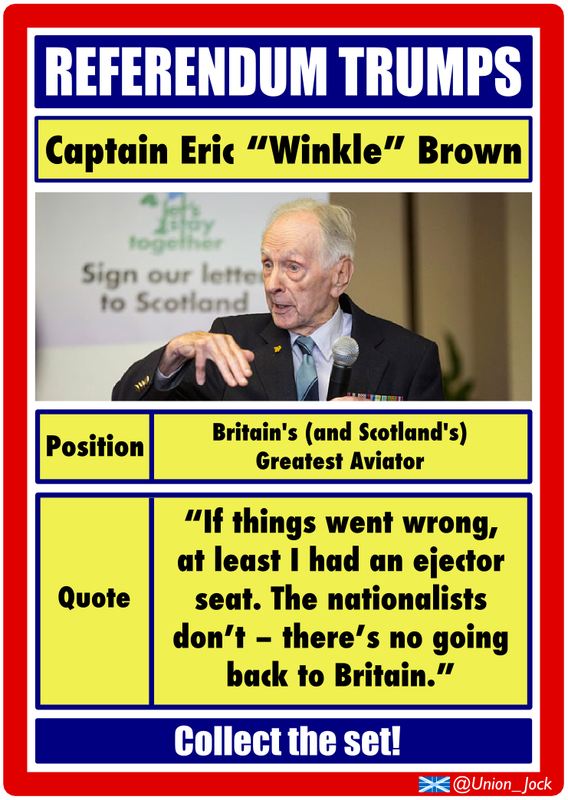 Eric "Winkle" Brown, former senior naval officer and Britain's (and Scotland's) greatest aviator. 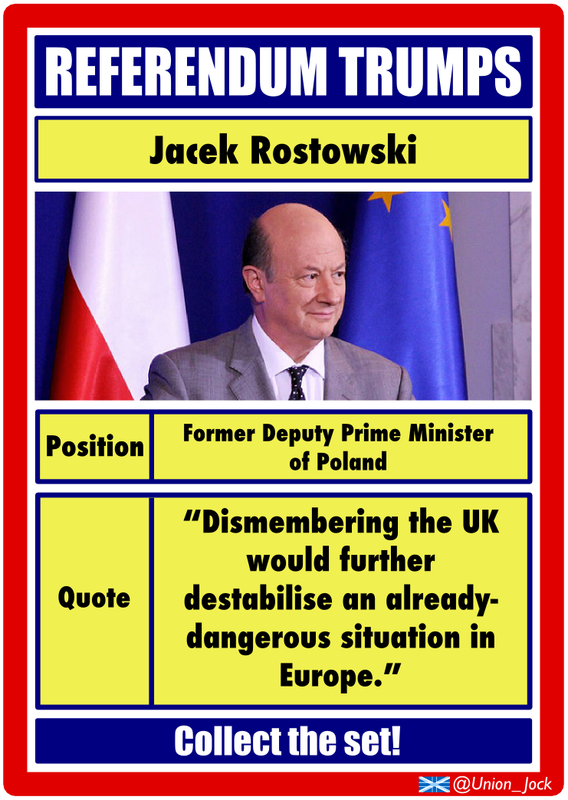 Referendum Trumps No.11: Jacek Rostowski, former Polish Deputy Prime Minister and Minister of Finance. 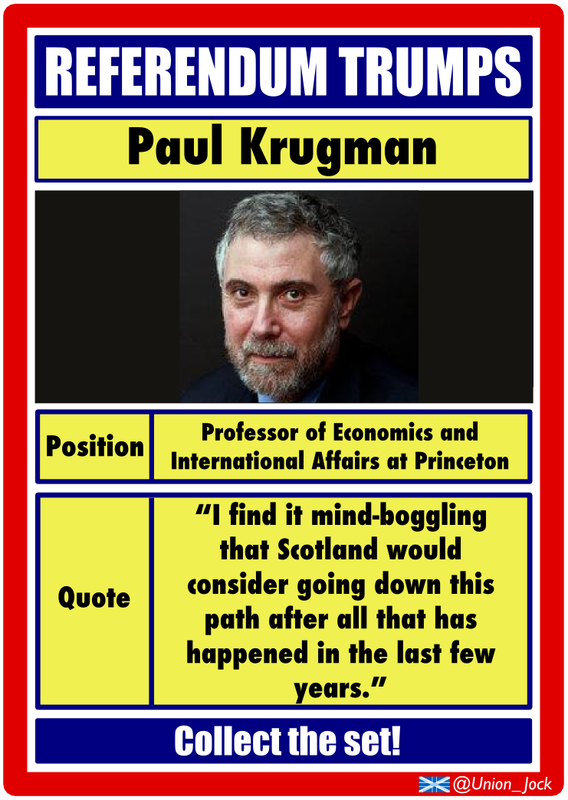 Referendum Trumps No.9: Paul Krugman, Professor of Economics & International Affairs at Princeton University. I'm going to pitch in on the referendum.....watching it unfold from afar is proving to be a pretty difficult and frustrating affair, and Alex Salmond may well have taken my right to vote, he will never take my voice! 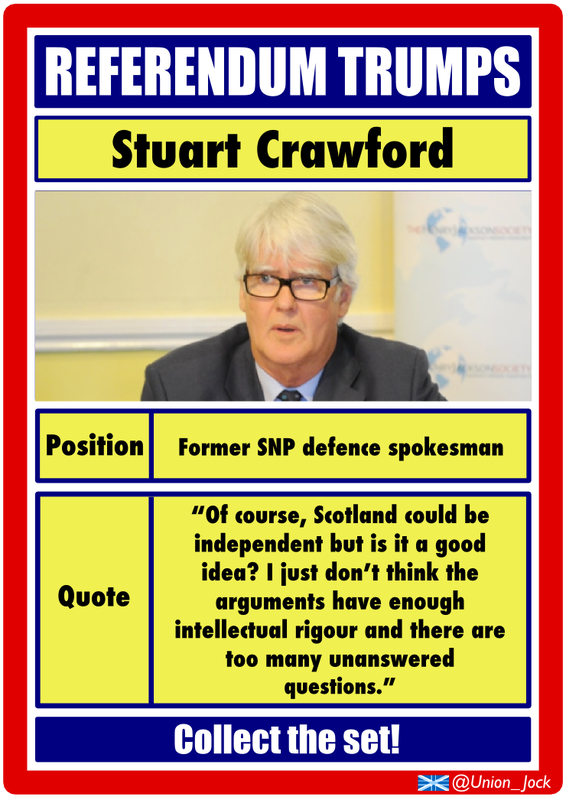 I don't believe in Scottish independence, nor do I want it. But I have read and listened to as much as I can on both sides and everything I have read and heard points to it being a massive risk and damaging to the most important things in day to day life: the economy, jobs, the quality of our national security are only three examples. The SNP calls this scaremongering (I do wish Salmond would dip into the dictionary and widen his vocabulary - Chambers was first published by an Edinburgh based publishing house for his likely issues with the Oxford one). I don't think that's fair, often it's been a case of pointing to the reality of arguments tending to be overloaded with emotion and hyperbole. The No campaign has naturally been pulled into the more defensive position of playing devil's advocate but that doesn't mean there isn't passion within us for a strong and successful Scotland. The issues aside, for me it comes down simply to the fact that I am proud to be Scottish, to be British and a part of the United Kingdom. As pieces of music, Flower Of Scotland and I Vow To Thee, My Country are, personally, equally rousing, equally moving. Unlike many around the world who awake every day to conflict and trouble, I am fortunate to have never had to worry about the consequences of the fabric of my country changing. 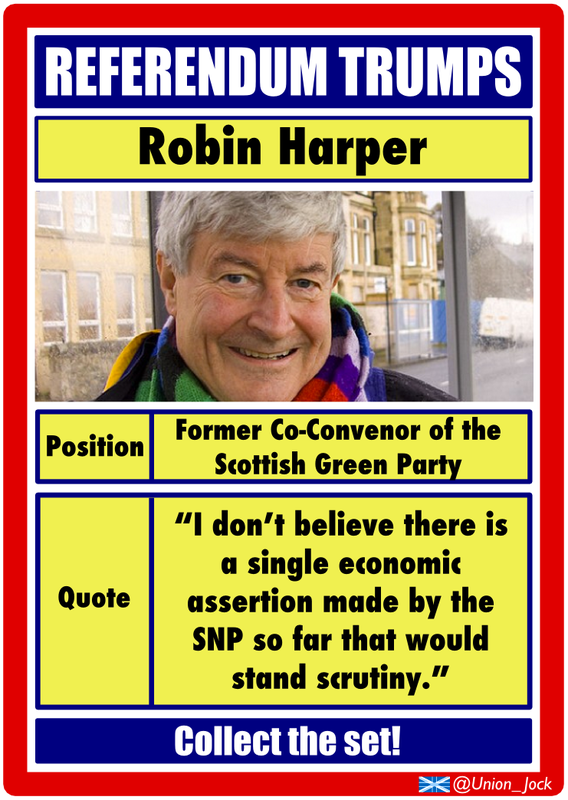 In the face of this uncertainty, I can't help feeling that there is strength in unity and that this whole debate has been foisted upon many of us as a result of a completely uninspiring set of MSPs in the Scottish parliament - turn out at the 2011 Scottish parliamentary election was just 50.6%. I can only hope that sense prevails among those with a vote next Thursday and the legacy we awake to on Friday morning is one of greater engagement and better representation in Scottish politics, rather than a tattered union. If like me you are worried about the reality of the latter prospect, then I would recommend reading this article by Michael Ignatieff, a Canadian politician who reflects on the Quebec referendum. 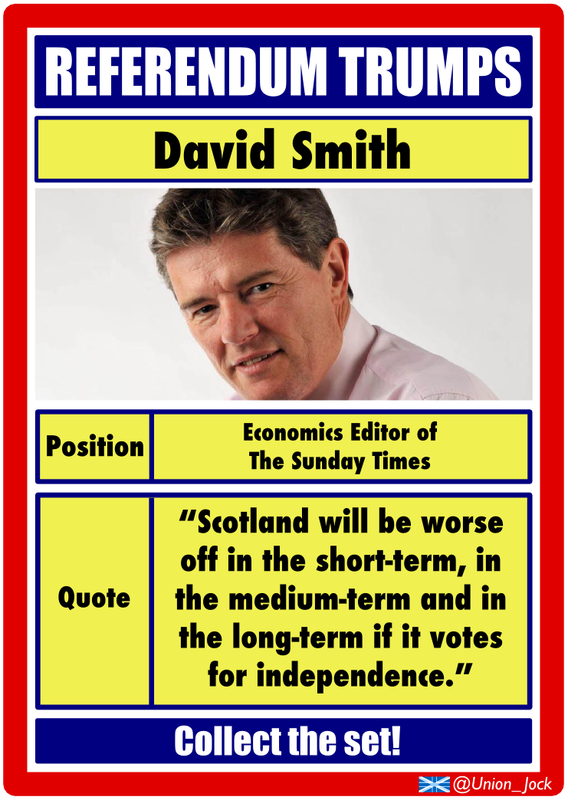 "This is the moral sin of separatism. 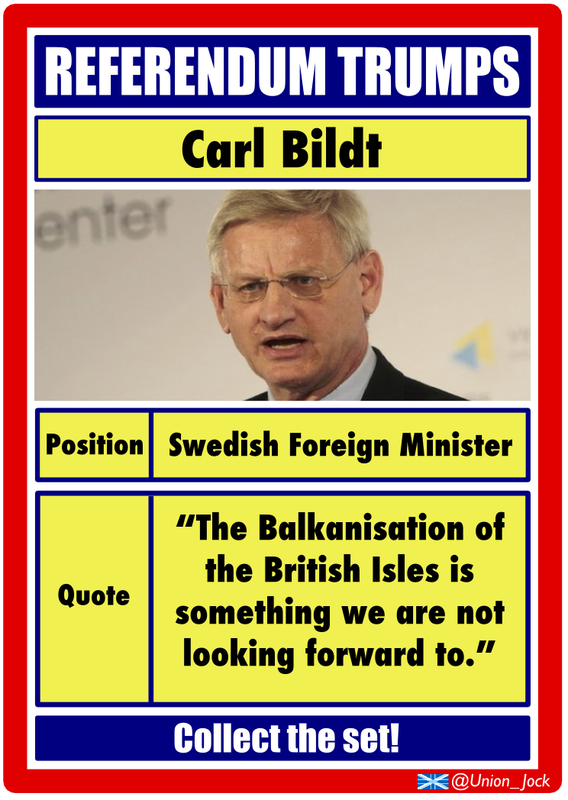 Separatist politicians, desiring to be presidents or prime ministers of little countries, force their fellow citizens to make choices that they should not have to make between identities that they have combined, each in their own unique way, and now watch being ripped apart – one portion of themselves flung on one side of a border, a damaged remnant on the other. 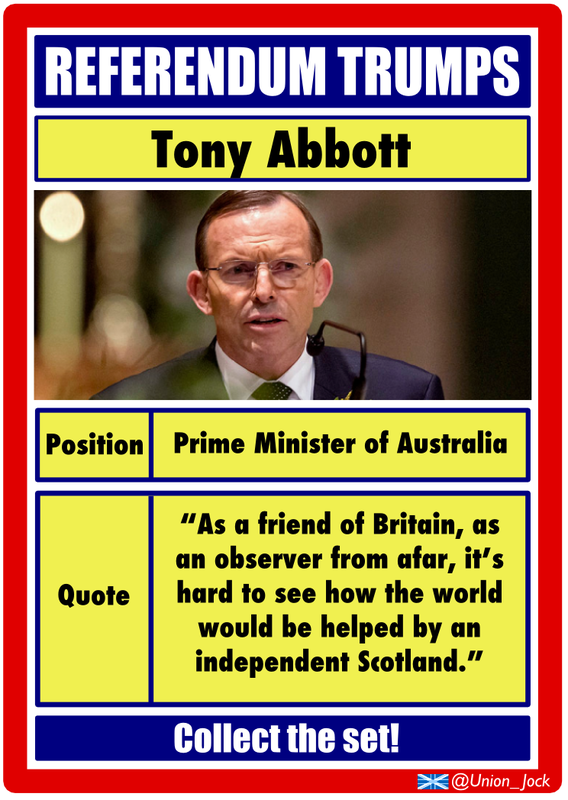 If Scotland does secede, there will be many torn souls the day after." Listening to the extreme language from Jim Sillars, about a 'day of reckoning' for certain companies after a yes vote on the 18th, is a reminder of the famous words from pastor Martin Niemoller in Germany. Must they be updated? "First they came for the banks and I did not speak out, because I was not a bank. Then they came for the executives of the supermarkets and oil companies and I did not speak out, because I was not an executive of a supermarket or oil company. 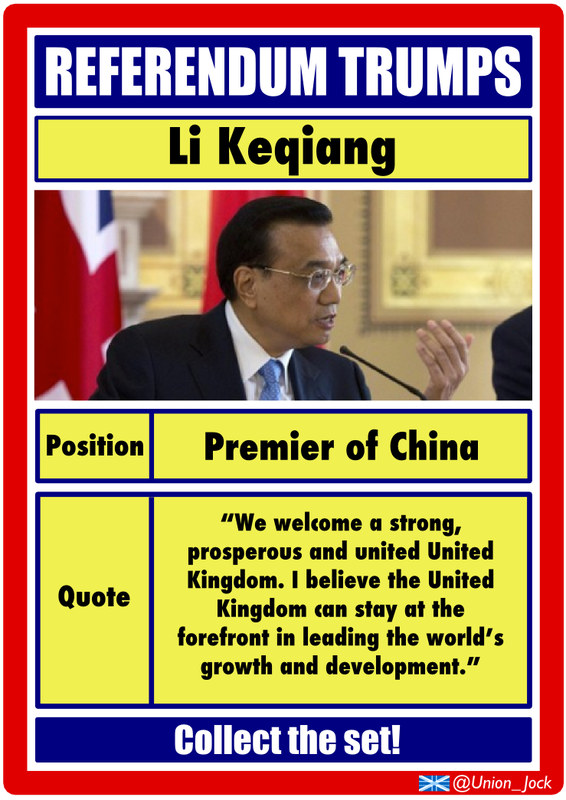 Then they came for those who had spoken at public meetings in support of the United Kingdom and I did not speak out, because I had not spoken at public meetings in support of the United Kingdom. Them they came for me, and there was no one left to speak for me". Let us all hope there is no day of reckoning. One of the achievements of the Scottish economy in recent years has been to encourage investment from overseas partners in key sectors of our economy. How can we possibly encourage such investment when a senior SNP leader, Jim Sillars, uses such intemperate language about 'a day of reckoning' for those companies which have warned about the dangers for the Scottish economy of a Yes vote. A shiver ran down my spine as I read his words “What kind of people do these companies think we are? They will find out". How business unfriendly that is! Imagine how a senior businessman in a foreign country will think of Scotland after this episode, words which will lie on the internet for years to come. 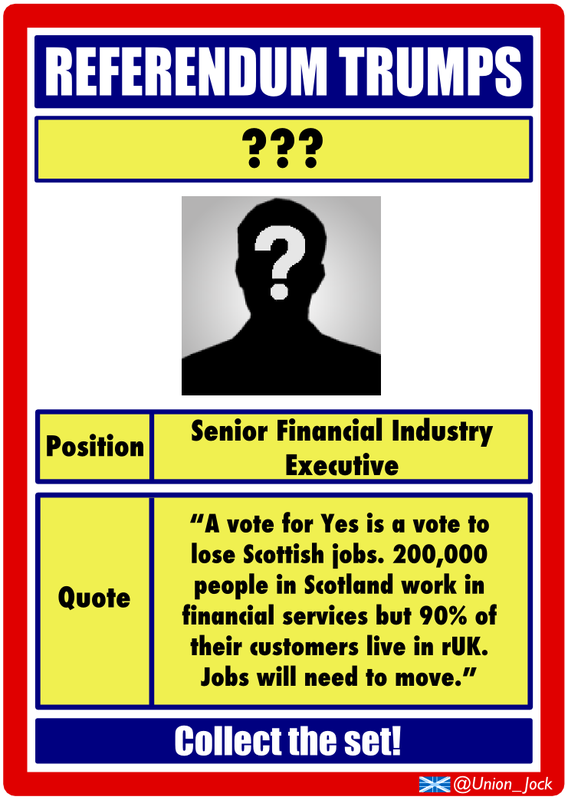 If you are undecided, please vote No, for the safety of so many Scottish jobs. 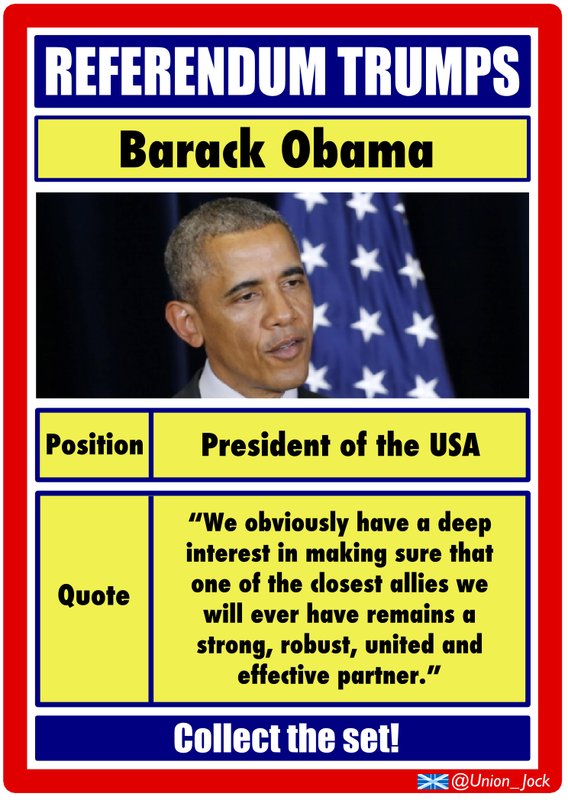 Introducing the first card of the Referendum Trumps pack. Collect the set!